So I decided to see how convenient it would be to do my weekly shopping at Wegmans last week. As always, I spent a few minutes in the freezer aisle and decided to do something different. I know I usually say it's unfair to compare premium ice cream to light ice cream, but well, I couldn't help myself. That is some wonky looking cookie dough on the cover. Looks like oatmeal cookie dough or something. Nutrition Check! 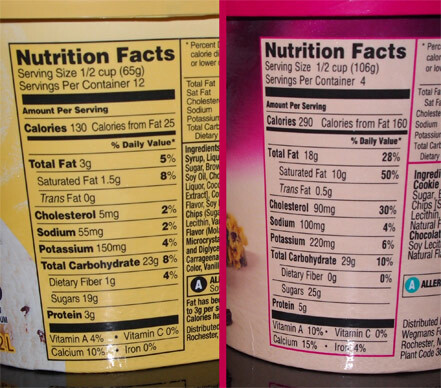 The premium is almost double the weight and protein, but check out the unhealthy stats: 6X the fat which in turn becomes over 6X the saturated fat and then 18X the cholesterol. The premium stuff better be awesome if it's gonna try to kill me this quickly. Oh, nice, both are sealed - I like to think it shows respect for the ice cream. Right off the bat, you'll notice a darker hue to the premium stuff. That's because while the light stuff is "cookie dough and chocolate chips in creamy ice cream", the good stuff is "cookie dough ice cream with cookie dough pieces and chocolate chips". Now technically "cookie dough" flavor is vague, but as soon as I read that, I knew that pint was only going one place = in my shopping cart. I've scooped down a bit and at first they do look like brothers, but look closer. Notice how dense the premium stuff is while the light ice cream has ripple upon ripple of air overrun. 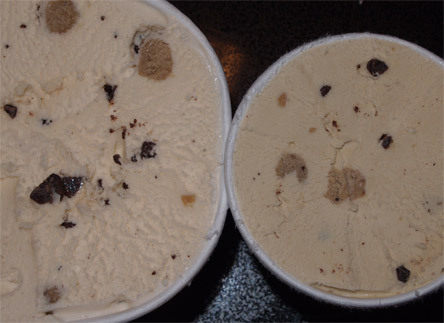 The cookie dough chunks look the same, and the chips actually look bigger in the light ice cream. (though maybe that just a Wegman's feature of a large container versus a pint container). Ok, are you ready for the fight? OH MY WORD! It's over!! KNOCKOUT!!! This is unheard of for a Friday night fight ladies and gentlemen! The lightweight extra churned upstart didn't stand a chance against the super flavorful blow from the Premium Wegman's ice cream. The crowd is on their feet! Wow, just wow, this is history in the making! hehehe, ok, I'll calm down, but honestly, that's how this fight went down. I took one bite of the premium version and my mind was blown with an intense cookie flavor that we all desire but rarely see. That one bite was all I needed to know how excellent this flavor is. I actually forced myself to take a bowl of the extra churned but I didn't enjoy it at all. It was too late, I was spoiled by the premium and no matter how hard I might try to reset my brain, it was over. My ice cream day was over. I wanted the good stuff, nay, the awesome stuff. Oh, alright, I'll give you a few thoughts on my boring bowl because as you can see from the this picture, it certainly looks tasty enough. There are a fair amount of chips, very crisp/crunchy, but there is not a ton of flavor from them. There are some cookie dough chunks (sans chips). They have some flavor, but not a ton. 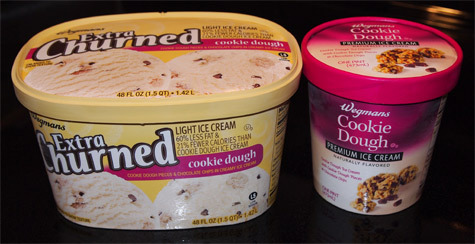 To be honest, I couldn't deduct a huge difference between the cookie dough chunks in the two versions. Oh I tried, I just wasn't able to pick up a huge difference. 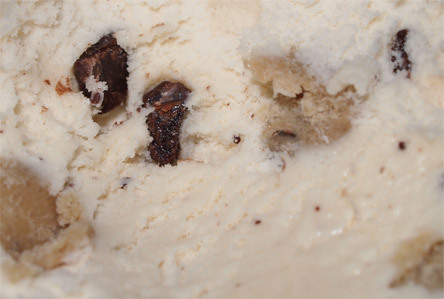 The base is fairly standard for light ice cream as it gives little resistance and melts quickly. Overall it's a very mellow flavor and would probably be ok on a late night second scoop, but first I need to flush out thoughts of the premium awesomeness from the tasty pint. Premium second scoop: Oh my word have I been enjoying this ice cream. Every night I would have a small serving and it just never disappointed. It one of those rare flavors where even I don't need a ton of it. Even a dozen or so small bites is a wonderful snack break. After awhile, I started thinking that the base is reminiscent of Three Twins sea salt caramel. 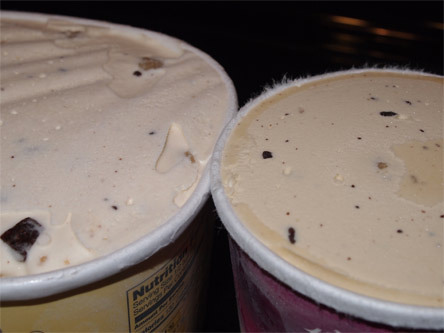 That's right, the super thick texture on the premium brings out a subtle dry caramel flavor to the whole pint. 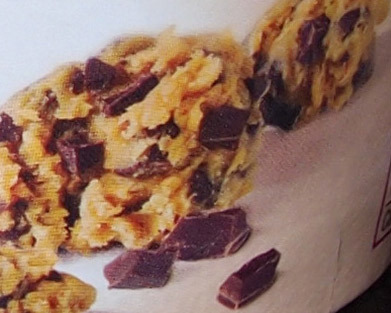 What a spectacular way to deliver a cookie dough flavor. The only bad thing here (besides the nutrition) is that it makes you question why no one else does this. I think Turkey Hill is the only flavor that comes close with their brown sugar cookie dough base. Light second scoop: BORING. Sorry, but reading the title again "creamy ice cream" instead of "vanilla ice cream" or "brown sugar ice cream" makes me realize that this one is kind of a snooze fest. Sure, my family ate it up and all, but this one is such a disappointment compared to the other one. It was never fair to compare the two, I realize this, but I did, and now I have paid the price. At least it's not some gummy, frozen dairy dessert disaster. Premium Buy Again? Do you have to ask? this is awesome. no wegmans near me, but I really like that you are doing these friday night comparisons! keep it up! the fights are always fun, I've got at least one more in store and then we'll go from there.